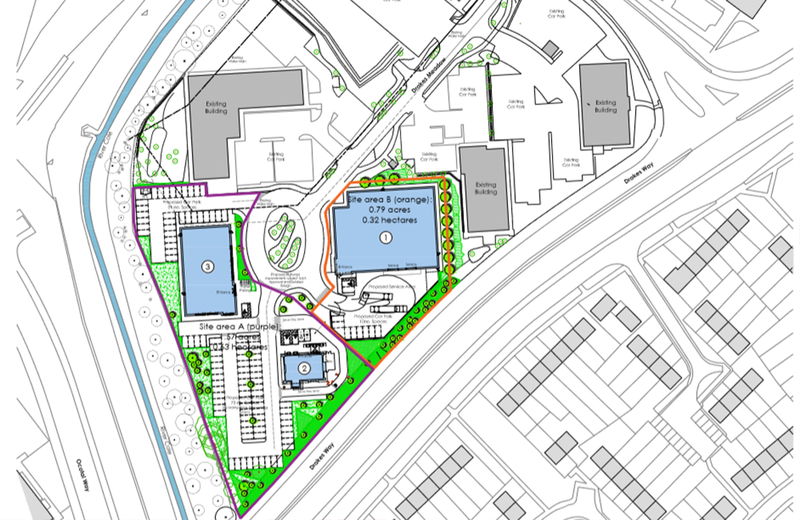 A planning application is being put together for a mixed use scheme. The intention is to develop a freestanding gym, drive thru and B Class uses although at this stage specific requirements can still be accommodated. Plots and/or buildings are available on both a leasehold and freehold basis. The current layout plan shows a freestanding gym, drive thru and warehouse with shared car parking accessed via Drakes Meadow. The site occupies a prominent location fronting Drakes Way on the Drakes Meadow Business Park currently accommodating offices and car dealerships. The site is close to the Greenbridge Retail Park and approximately 1 mile from Swindon town centre and railway station and 4 miles from junction 15 of the M4. The site is accessed via an all-ways traffic light junction.